As you can infer, I spent most of my adolescence covering myself up, so I pretty much missed out on crop tops first time around. Nor did I partake of the late '90s resurgence--I was in college at the time and carrying around quite the beer belly. So here I am again, confronted with the crop, and the question is, to bare or not to bare? 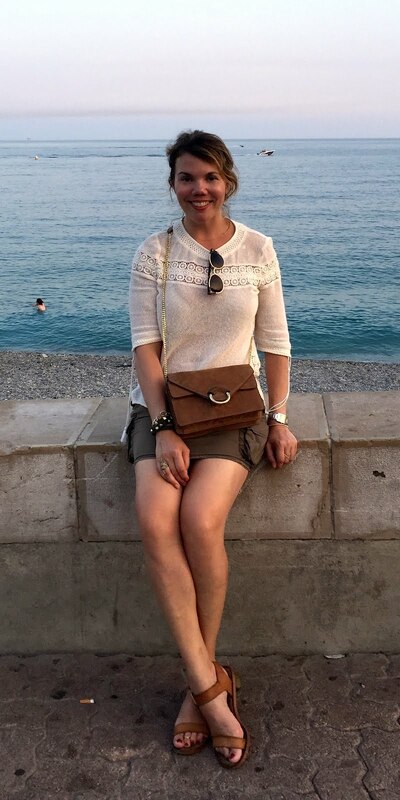 The next time this trend comes around, I have a feeling I will be past my prime--literally and figuratively--and so it appears this season I will finally confront my fear of exposed midriff. As the kids these days say, YOLO. It's important for crop tops to be snug, because you want them to stay in place when you raise your arms. And yet, sometimes you want a little volume on top, so this McQ crocodile-print top is perfect: it's snug at the waist, but the tiered front creates a flattering layered effect. In terms of crop tops, this is about as demure as it gets. 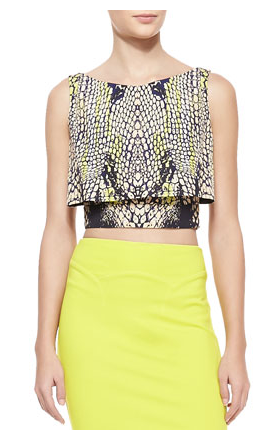 Not demure: this Herve Leger crop top, which looks like something a pre-Kanye Kim Kardashian would wear. I appreciate its unabashed trashiness; and yet, paired with a high-waisted, fuller skirt and maybe even tights, it could, like Kim K., clean up quite nicely. The key to wearing this year's crops (ok, got that pun out of the way) is to pair them with a high-waisted skirt, so you're exposing just a sliver of stomach. That way, you can make the above Herve Leger top, or this Yigal Azrouel scuba top, look slightly more demure. Think Kelly and Donna, not Britney and Christina. Speaking of which, I would not recommend wearing this Torn by Ronny Kobo Emma top as styled; however, I do like its '90s-minimalist striped look--it needs a stretchy pencil skirt and maybe some Doc Martens. Also on sale is one of my favorites of the bunch, this Elizabeth and James dalmatian-print top, primarily because it has a rare boxier shape, which would allow me to wear something more slim-fitting on the bottom. And should this trend be fleeting, you could always layer it over a slim-fitting tank or dress down the road. One of the first places I started seeing crop tops--a few seasons ago--was Zara. It's also one of the first places I'd go for something I'm unsure about; Zara's stuff tends to strike that perfect balance between trendiness and cost-effectiveness. That said, I like this asymmetric crop top because it's totally working that Calvin Klein vibe, but also because of the way the back dips down to elegantly cover up one's back fat. 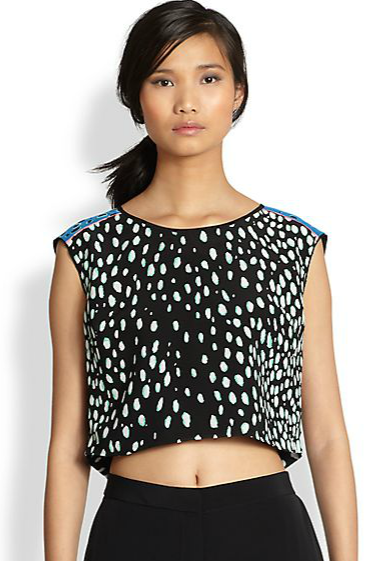 Even though it's one of the simpler styles here, I am totally into this Rachel Rachel Roy cropped top. It reminds me of something the model being romanced by George Michael in one of his videos would wear. That or backup dancers in a rap video. Either way, can't lose. It would also make a lovely layering piece, which is probably what it will end up doing in my closet. There are so many crop tops on Nasty Gal, I could have written a post on their many different varieties. And while I'm not sure I sorted through every last one, I do think this striped top is one of my favorites. The boxy fit is a little more versatile, and the stripes manage to look somewhat classic and cool--qualities that one should always strive for, even whilst exposing one's midriff.